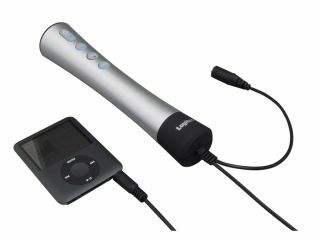 For the bargain price of just ¥5,980 (£30), you and your iPod-toting friends can now become the most annoying people outside of any Big Brother house thanks to a breakthrough in karaoke technology from Japan. Logitec's LAT-PKARA01SV microphone may not even have a proper name, but don't let that put you off sharing your vocal talents with all and sundry through the magic of FM. The handheld mic takes audio input from any source - naturally, an iPod features heavily in Logitec's marketing - and mixes the vocal track down to almost zero. Sing - or breathe heavily - into one end and the software inside combines your efforts with the source music before pushing the result out the other end and onto any nearby FM radio. There are adapters for connecting to mobile phones and sucking the life out of any music therein, as well as the usual karaoke functions for adding reverb and upping the volume to ear-splitting. A pair of AAA batteries will last about four hours, by which time we sincerely hope someone will have seen sense. Thankfully, Logitec has no plans to foist this thing on the rest of the world.